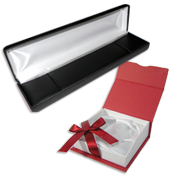 Find the best Bracelet & Watch Boxes for your store & transform the way you showcase your collections! Our selection of quality cases features leatherette, velvet & cardboard pieces, for every budget. You'll find pillow & bangle items, in many colors, such as black, rosewood, blue & others. Get the best deals thanks to our wholesale discounts!